We know that parents need healing too. They have a variety of reactions and feelings upon finding out that a child they love has been sexually abused. Many of the ways they have coped in the past may not be helping them in this situation and many times the complex situations related to sexual abuse will decrease support persons and resources available to them. Helping parents, who are secondary survivors, can help the parent in their healing process and help them better provide support and care for their child. The group will run for 8 consecutive weeks on Thursday evenings beginning at 5:30 p.m. It will be hosted at STAR’s office, located at 1412 Peterman Drive, Suite A, Alexandria, LA 71301. The group will work to build rapport with one another to establish a source of support and healing. As this is a therapeutic group, the group rules will be addressed in group meetings to meet the needs of the parents in the group. 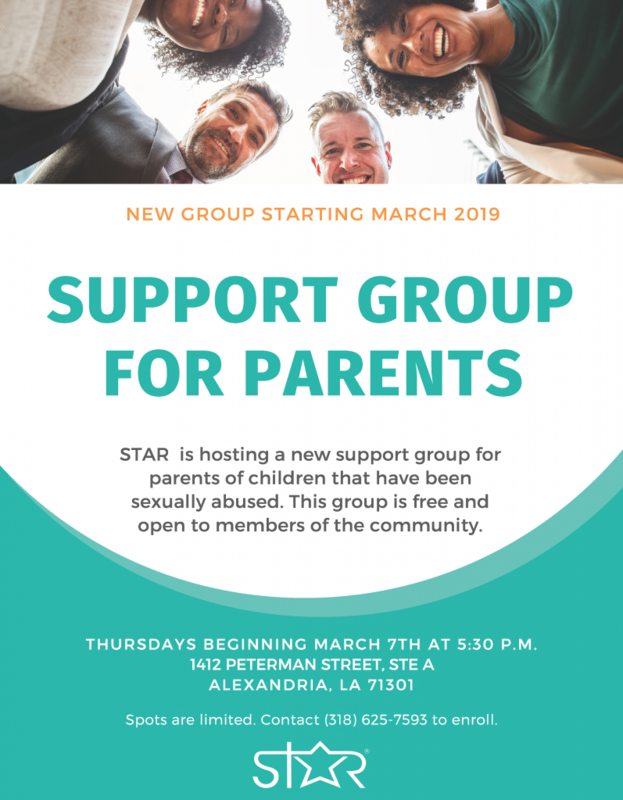 Those interested in enrolling in the group can contact the STAR office at (318) 625-7592. A group assessment will be required prior to attendance at the group.